Last Friday was party time again at Friday Friends in Huddersfield. 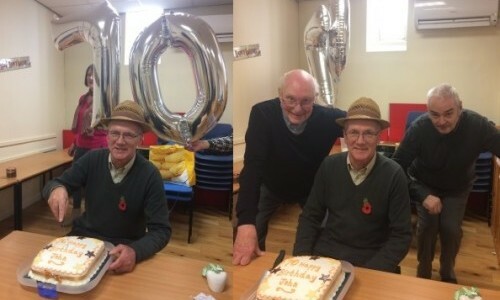 John, one of our volunteers celebrated his 70th birthday with us. He still served the drinks and the food even though it was his special day! He won the bingo too! Definitely his lucky day! John did however have to share his special day with two more members of our Friday Friends group, Richard and Robert. The boys were all in for the photo. We joined them in a celebratory sherry/orange juice and a good time was had by all. For further information regarding the Thursday or Friday Friends group held at Our Lady of Lourdes Church Hall in Huddersfield please contact Michelle on 07739 975000. There’s always room for more friends! Everyone absolutely always welcome! !